Show your customers you care about their vehicle by placing a floor mat in every vehicle in for service. These Full Adhesive mats are perfect for keeping the carpets of new vehicles clean until delivery. 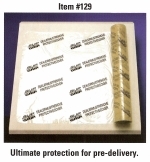 Mats are constructed of 4-mil plastic with full adhesive backing. Mats are a big 21in x 24in. Each roll has 175 mats..